A pretty maid, a Protestant, was to a Catholic wed; To love all Bible truths and tales, quite early she'd been bred. It sorely grieved her husband's heart that she would not comply, And join the Mother Church of Rome and heretics deny. He went to see his clergyman and told him his sad tale. "My wife is an unbeliever, sir; you can perhaps prevail; For all your Romish miracles my wife has strong aversion, To really work a miracle may lead to her conversion." The priest went with the gentleman-he thought to gain a prize. He said, "I will convert her, sir, and open both her eyes." So when they came into the house, the husband loudly cried, "The priest has come to dine with us!" "He's welcome," she replied. The greatness of our Savior's love, which Christians can't deny, To give Himself a sacrifice and for our sins to die. "I will return tomorrow, lass, prepare some bread and wine; The sacramental miracle will stop you soul's decline." "I'll bake the bread," the lady said. "You may," he did reply, "And when you've seen this miracle, convinced you'll be, say I." The priest did come accordingly, the bread and wine did bless. The lady asked, "Sir, is it changed?" The priest answered, "Yes, It's changed from common bread and wine to truly flesh and blood; Begorra, lass, this power of mine has changed it into God!" For half an ounce of arsenic was mixed right in the batter, But since you have its nature changed, it cannot really matter." The priest was struck real dumb—he looked as pale as death. The bread and wine fell from his hands and he did gasp for breath. "Bring me my horse!" the priest cried, "This is a cursed home!" The lady replied, "Begone; tis you who shares the curse of Rome." The husband, too, he sat surprised, and not a word did say. At length he spoke, "My dear," said he, "the priest has run away; To gulp such mummery and tripe, I'm not for sure, quite able; I'll go with you and well renounce this Roman Catholic fable." The very idea of Christ—"flesh and blood, body and soul, Divinity and humanity"—being offered repeatedly as a "renewal" of the sacrifice of the cross, stands in sharp contrast to the words of Jesus on the cross, "It is finished" (John 19:30). The Old Testament sacrifices had to be continually offered because none of them was the perfect sacri-fice.But now "we are sanctified through the offering of the body of Jesus Christ ONCE for all. For every priest standeth daily ministering and offering oftentimes the same sacrifices, which can never take away sins: but this man (Christ), after he had offered ONE sacrifice for sins for ever, sat down on the right hand of God., .for by ONE offering he perfected for ever them that are sanctified " (Heb. 10:10-14). After the bread has been changed into "Christ" by the priest, it is placed on a monstrance in the center of a sunburst design. Before the monstrance Catholics will bow and worship the little wafer as God! This practice, in our opinion, is similar to the practices of heathen tribes which worship fetishes. Is it scriptural? Notice what The Catholic Encyclopedia says: "In the absence of Scriptural proof, the Church finds a warrant for, Monstrance and a propriety in, rendering Divine worship to the Blessed Sacrament in the most ancient and constant tradition..."9 This reasoning brings to mind the words of Jesus, "...making the word of God of none effect through your tradition" (Mark 7:13). Adopting the idea that the elements of the Lord's Supper become the literal flesh and blood of Christ was not without its problems. 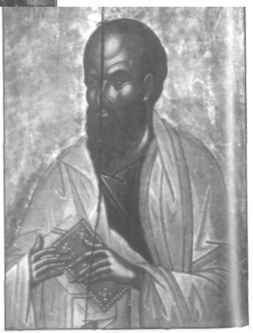 Tertullian tells us that priests took great care that no crumb should fall—lest the body of Jesus be hurt! Even a crumb was believed to contain a whole Christ. In the Middle Ages, there were serious discussions as to what should be done if a person were to vomit after receiving communion or a dog or mouse were by chance to eat God's body! At the Council of Constance, it was argued whether a man who spilled some of the blood of Christ on his beard should have his beard burned, or if the beard and the man should be destroyed by burning. It is admitted on all sides that numerous strange doctrines accompanied the idea of transubstan-tiation. In the New Testament church it is evident that Christians partook of both the bread and the fruit of the vine as emblems of Christ's death (1 Cor. 11:28). This The Catholic Encyclopedia admits. "It may be stated as a general fact, that down to the twelfth century, in the West as well as in the East, public Communion in the churches was ordinarily administered and received under both kinds," a fact "clearly beyond dispute. "10 But, after all these centuries, the Roman Catholic Church began to hold back the cup from the people, serving them only the bread. The priest drank the wine. One argument was that someone might spill the blood of Christ. But was it not possible that the early disciples could have spilled the cup? Christ did not withhold it from them on this basis! Serving only half of what Jesus had instituted called for certain "explanations." It was explained that "communion under one kind", as it was called, was just as valid as taking both. The people would not be deprived of any "grace necessary for salvation" and that "Christ is really present and is received whole and entire, body and blood, soul and Divinity, under either species alone...holy mother the Church ...has approved the custom of communicating under one kind...Not only, therefore, is Communion under both kinds not obligatory on the faithful, but the chalice is strictly for bidden by ecclesiastical law to any but the celebrating priest"!11 After many centuries, this law has now been relaxed. Some Catholics are allowed to partake of both bread and cup, but customs vary from place to place. Hosts are made in a round shape, this form first being mentioned by St. Epiphanius in the fourth century.19 (TTie illustration shows the way the "host" appears in a Catholic picture dictionary.) But when Jesus instituted the memorial supper, he simply took bread and brake it. Bread does not break into round pieces! Breaking the bread actually represents the body of Jesus which was broken for us by the cruel beatings and stripes. But this symbolism is not carried out by serving a round, disk shaped wafer completely whole. If the use of a round wafer is without scriptural basis, is it possible that we are faced with another example of pagan influence? Hislop says, "The 'round' wafer, whose 'roundness' is so important an element in the Romish Mystery, is only another symbol of Baal, or the sun"2Q We know that round cakes were used in the ancient mysteries of Egypt. "The thin, round cake occurs on all altars. "21 In the mystery religion of Mithraism, the higher initiates of the system received a small round cake or wafer of unleavened bread which symbolized the solar disk,22 as did their round tonsure. In 1854 an ancient temple was discovered in Egypt with inscriptions that show little round cakes on an altar. Above the altar is a large image of the sun 23 A similar sun-symbol was used above the altar of a temple near the town of Babain, in upper Egypt, where there is a representation of the sun, before which two priests are shown worshipping. (See illustration). 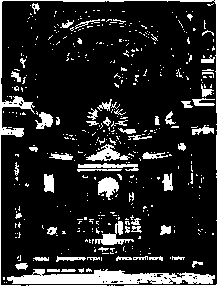 the monstrance sun-image—in which the host is placed as a "sun" and before which Catholics bow—and a striking similarity will immediately be seen. 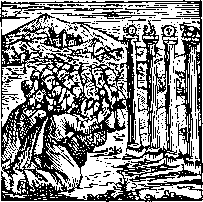 Even among the Israelites, when they fell into Baal worship, sun-images were set up above their altars! But during the reign of Josiah, these images were torn down: "And they brake down the altars of Baalim in his presence; and the images (margin, sun-images) that were on high above them" (2 Chron. 34:4). 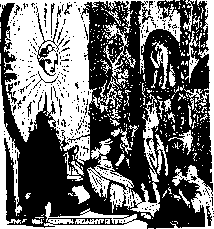 An accompanying old woodcut illustrates some of the strange images that they worshipped, including two sun-images at the top of columns. Interior of St, Peter's showing sun images. Interior of the Church of the Gesu, Rome. Egyptian builders to place a solar disk (sometimes with wings or other emblems) over the entrance of their temples— to honor the sun-god and drive away evil spirits. We are not suggesting, of course, that the round designs in use today convey the meanings they once did to those who went to heathen temples. Nevertheless, the similarity seems significant. 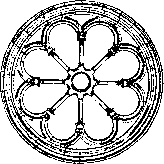 The circular window that has been so commonly used above the entrances of churches is sometimes called a "wheel" window. The wheel design, as the wheel of a chariot, was believed by some of the ancients to also be a sun-symbol. They thought of the sun as a great chariot driven by the sun-god who made his trip across the heavens each day and passed through the underworld at night. When the Israelites mixed the religion of Baal into their worship, they had "chariots of the sim"—chariots dedicated to the sun-god (2 Kings 23:4-11). An image in the form of a chariot wheel is placed over the famous statue of Peter in St. Peter's. A tablet now in a British museum shows one of the Babylonian kings restoring a symbol of the sun-god in the temple of Bel. The symbol is an eight pointed cross, like a spoked wheel. A similar design marks the pavement of the circular court before St. Peter's. (See page 43). circular sun-symbol disk around their heads. The Roman tonsure is round. Round images are seen above the altars and entrances. The monstrance in which the round host is placed often features a sun-burst design. All of these uses of sun symbols may seem quite insignificant. But when the over-all picture is seen, each provides a clue to help solve the mystery of Babylon modern. The round wafers of the Mass are often pictured as circles marked with crosses. We can't help but notice how ©©© similar these are to the round wafers seen in the drawing of an Assyrian monument which we have reproduced below. When Jesus instituted the memorial supper, it was at night. It was not at breakfast time, or at lunch time. The first Christians partook of the Lord's supper at night, following the example of Christ and the types of the Old Testament. But later the Lord's supper came to be observed at a morning meeting.28 To what extent this may have been influenced by Mithraism, we cannot say. We do know that the Mithraic rites were observed early in the morning, being associated with the sim, with dawn. For whatever reason, it is now a common custom among both Catholic and Protestant churches to take the Lord's "supper" in the morning. morning was an easier time to meet this requirement! But to require such fasting cannot be solidly built on scripture, for Jesus had just eaten when he instituted the memorial supper! 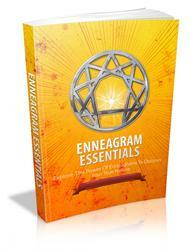 On the other hand, those who sought initiation in the Eleusi-nian mysteries were first asked: "Are you fasting?" If their answer was negative, initiation was denied.29 Fasting itself is, of course, a Biblical doctrine. But true fasting must come from the heart and not merely because of a man-made rule. Of such, God says, "When they fast, I will not hear their cry" (Jer. 14:12). The Pharisees were strict about fasting on certain days, but neglected the weightier matters of the law (Matt. 6:16). Paul warned about certain commandments to "abstain from meats" as being a mark of apostasy (1 Tim. 4:3). In commenting on the Mass and its elaborate ritualism, Romanism and the Gospel s^ys: "It is a spectacle of gorgeous magnificence—lights, colors, vestments, music, incense, and what has a strange psychological effect, a number of drilled officiants performing a stately ritual in entire independence of the worshippers. These are indeed spectators, not participants, spectators like those who were present at a performance of the ancient mystery cults. "30 A noted work on Catholicism summarizes the mechanical performance made by the priest during Mass: "He makes the sign of the cross sixteen times; turns toward the congregation six times; lifts his eyes to heaven eleven times; kisses the altar eight times; folds his hands four times; strikes his breast ten times; bows his head twenty-one times; genuflects eight times; bows his shoulders seven times; blesses the altar with the sign of the cross thirty times; lays his hands flat on the altar twenty-nine times; prays secretly eleven times; prays aloud thirteen times; takes the bread and wine and turns it into the body and blood of Christ; covers and uncovers the chalice ten times; goes to and fro twenty times. "31 Adding to this complicated ritualism is the use of highly colored robes, candles, bells, incense, music, and the showy pageantry for which Romanism is known. What a contrast to the simple memorial supper instituted by Christ! What is the meaning of roman miracle?